Clean and Clear Cartridge Filter 75 Sq. 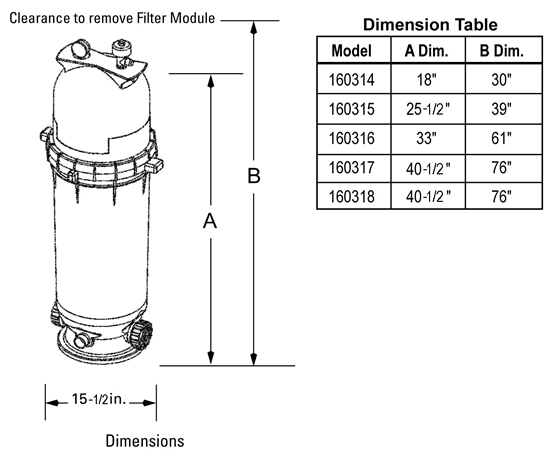 Ft.
Would this filter be a good replacement for a hayward DE filter model ec65? My pool is inground and 18k gallons with a hayward super pump 3/4hp. What's the approximate cleaning interval for a filter of this size with my pool? Hi, Chris. I would recommend a larger capacity cartridge filter like the Clean and Clear Cartridge Filter 150 Sq. Ft. - 160317. Hi Ed, When sizing a filter you want to make sure that the filter can handle the output of water from the pump. This is measured in Gallons Per Minute (GPM), normally a pool pump is sized to turn your pool over in 8 Hrs. and if your pump was sized properly then this 75 Sq. Ft. (75 GPM) filter should be fine for your pool. With a pool filter, it is always better to go bigger so if you wanted to go up to a 100 Sq. Ft. Filter then you would have a longer time between cleaning your cartridge and you put less stress on your pump. My pool holds 17,000 gallons of water which filter would it require? Hello, This filter 160315 Clean and Clear Cartridge Filter 75 Sq. Ft. is perfectly adequate for this type pool.